[toc] Too much of exposure to asbestos can result in the growth of a cancer known as mesothelioma. Tumors afflict the lining of the organs named mesothelium and they spread to different parts of the entire body. There is no good prognosis available for mesothelioma and this disease is considered to be very dangerous and serious. Pleural effusion is a condition of the body when there is too much fluid found to be built up in the lung linings. This can result in chest pain and can also make a person feel difficulty while breathing which is also known as dypsenea. It is a very serious symptom that needs to be treated as soon as possible because it can lead to dangerous situations of health. Dry cough is not accompanied with phlegm which means that the cough is not because of cold. Dry cough can serve as one of the most eminent mesothelioma symptoms and it is important to report this to the doctor on an immediate basis. 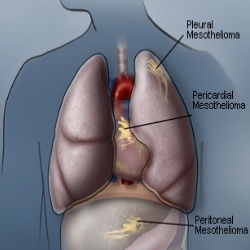 This is a group of mesothelioma symptoms that are quite abnormal but they can serve to be great threats for the overall health of the body and the life of an individual. Such symptoms include eyeball sinking, inability to sweat which is also known as anhidrosis, droopy eyelids and pupil constriction that is quite abnormal. All these complications are the direct result of the paralysis of nerves and should be treated immediately. There are many people who suffer from loss of weight and they consider this to be very normal. But sometimes weight loss can serve as a symptom of mesothelioma and therefore it is important to take the necessary steps. The first thing to do is to go for an overall checkup and to pay a visit to the doctor. One of the most poignant signs of mesothelioma are lumps that are found around the abdomen and the chest of an individual. These lumps cannot be seen but they can be felt while taking a shower or a bath. It is always important to take proper care if such lumps are noticed because they can turn out to be cancerous. Stomach mesothelioma can result in abdominal swelling that can be misinterpreted as weight gain. This abdominal swelling should not be taken lightly. It is important to take proper attention and care for abdominal swelling because the swelling might be the result of fluid accumulation in the cavity of the abdominal area. This is an alarming symptom of mesothelioma that can be noticed during the early stages of the disease. If coughing is accompanied with blood, hoarseness and difficulty in swallowing food can also be experienced by an individual.